At the time I was reviewing this disc it won the 2013 ICMA award for best Baroque Vocal recording. Gratifying, but hardly surprising given the high musical and technical standards set by earlier instalments in this Muri-based series. I warmly welcomed – and still relish – Johannes Strobl’s collection of Christmas Preludes (review) and I’ve had the pleasure of hearing his and David Blunden’s Music for Two Organs as well. Both recordings were made in the Abbey Church of Muri, which is also the early seat of the Habsburgs. This noble edifice has two fine organs and a glorious acoustic, all of which have been faithfully caught by Audite’s expert engineers. 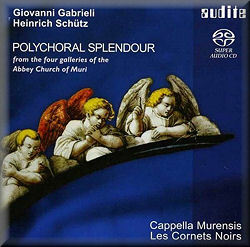 This polychoral album makes full use of the church’s galleries; the two-, three- and four-part vocal writing is underpinned by the two Brossart organs – ‘Evangelienorgel’ and ‘Epistelorgel’ – and supplemented by Les Cornets Noirs. The latter gets its name from the black-leather-covered cornetts or ‘zinks’ popular between 1500 and 1650. Posaunen (trombones) and the violone in G (a forerunner of the modern double bass) give the music its unique late Renaissance/early Baroque flavour. As for Muri’s music director Johannes Strobl and the compact, but beautifully blended Cappella Murensis, they made an indelible impression on me with that disc of Music for Two Organs. With such stellar expectations surely I was bound to be disappointed? Emphatically not; from that rousing Schütz opener = deep, burnished and with a tremendous sense of occasion – it’s clear we are in for something rather special. Even in SACD stereo the antiphonal effects are evident, although I imagine the multichannel mix would be even more immersive. Gabrieli’s Sacrae Symphoniae are equally splendid – the Canzon primi toni a 8 is lithe and lovely – and while the synchronisation of all these forces is a challenge there are very few instances where it’s a perceptible issue. What really makes my hair stand on end is hearing how well Audite’s engineers have captured the authentic timbres – the rasp and reach – of these zinks and posaunen, the sound of which fills every corner of this votive space. Cappella Murensis distinguish themselves throughout, Schütz’s lively ‘Saul, Saul, was verfolgst du mich?’ especially fine. The various organists – David Blunden is familiar from the Music for Two Organs – bring low-end heft and upper-end sparkle to the proceedings. As for Strobl, he marshals his forces with consummate skill, always alert to the solemn sonorities and rhythmic ‘swing’ of this churchly repertoire. One of the loveliest pieces here is Gabrieli’s upwardly twining Sonata XVIII a 14, which grows and effloresces in the most magical way. How pleasing it is to hear this music played with such accuracy and weight, rather than with the often approximate, strained-through-the-sheets sound beloved of some performers. If this isn’t your usual fare Strobl et al will surprise and delight you with this captivating collection. How gravely beautiful is Schütz’s ‘Ich danke dem Herrn von ganzem Herzen’, and how feelingly done. Gabrieli’s brass-laden Canzon in echo duodecimi toni a 10 – with its clarion calls and distant responses – is most effective, with just enough ‘edge’ to add to the excitement rather than too much to dull it. What better way to conclude this joyous disc than with Schütz’s all-embracing, heaven-resounding ‘Alleluja! Lobet den Herrn’. Not since Paul McCreesh’s splendid recording of Praetorius’s Lutheran Mass for Christmas Morning (review) have I experienced such an overwhelming sense of occasion, or felt so awed by the celestial sounds encircling me. Even in its Red Book form the reccording has real presence and plenty of ‘air’ around the performers. This is a 24/44.1 recording but, as always, expert engineering is much more revealing than the raw numbers might suggest. A worthy ICMA winner, this release has stolen its way into my affections; indeed, it’s seldom been out of my player these past few weeks. Good liner-notes and sung texts complete this most desirable package. My store of enchanted objects has just increased by one; a magnificent disc.